Today the port of call is Cannes. Tonight, after the ship leaves, a barbecue/buffet will be hosted for the guests. 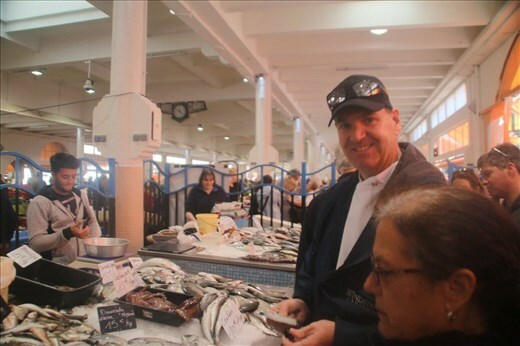 In order to prepare for the barbecue, the chef goes to a market in town to buy fresh cheeses, olives, etc, and in something that certainly doesn't happen on larger cruise ships, the chef hosts a shore excursion to the market, so we can join him on his shopping trip. The Chef, who we we're introduced to the other night-was Chef Jeff-a bear like brown haired man who hails from Canada. Rather then coming across as an Emerill type he sounds more like Gomer Pyle. We met in the lobby of the ship, and the group of us-approximately 40 people, walked with the chef and a member of the ship staff to the large, market building, with alll types of stahls. The chef walked around, explaining his methdology, how he buys a little from different vendors so nobody feels left out. He stopped by markets selling different types of fish. The vendors all seemed to know who he was. Then we walked over to various markets selling cheese. The chef's assistant obtained a tray of samples from the vendor, and we each tried the various types of cheese, most with the fresh, tangy, taste that is so much better than those obtained in the supermarket. We went to a few vendors like this. The chef fielded questions, like the one I asked-why is goat cheese different then cow cheese? (I don't remember the answer). We went to stafls with crackers and all types of spreads....once again, just the taste of freshness. Then we went to vendors who we're pushing olives, and once again, we had various samples from the Chef's assistant. The olives we're juicy, and sometimes, unbelievely salty. Once again, eating Olives in a market on the edge of the Mediterranean was so different then the supermarket. After about an hour in the market or so, the chef completed his purchasing, and went back to the ship with those who wanted to follow. I went out on the town.